Choosing bathroom lighting isn’t the easiest choice. The first consideration is whether your lights in the bathroom need to be ‘IP’ rated or not? That is the level of ‘Ingress Protection’. In a bathroom the light can be subjected to water splash, steam, but it is not necessarily the case that an IP rated light is a requirement although it might be advised if the light fitting is to enjoy a long life in a steamy, highly humid atmosphere. 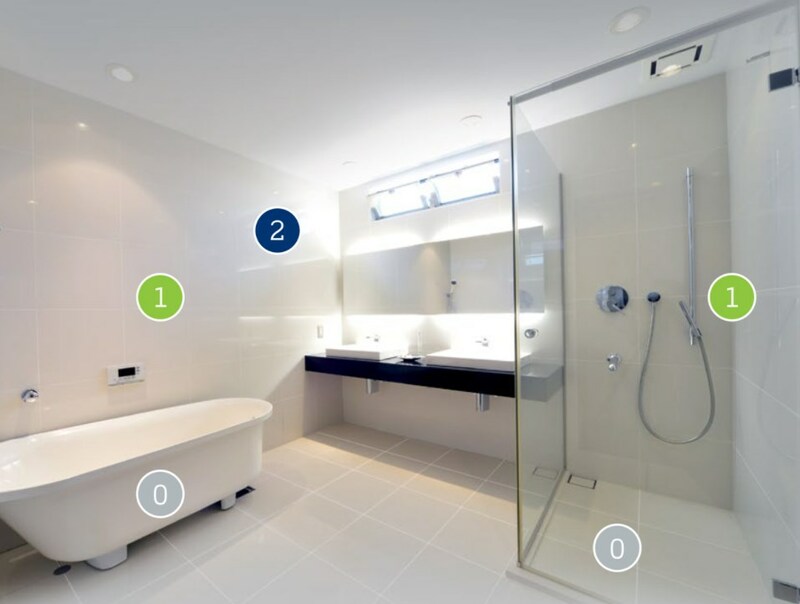 The bathroom area has been divided up into 'zones' or areas which are classified using the numbers 0-2. Light fittings are then assigned an IP rating which indicates how much protection they provide against ingress of water and other particles. Each zone has a minimum IP requirement that must be met if a fitting is to be installed in this area. Refers to the interior of the bath or shower that can hold water. Requires electrical products to be low voltage (max. 12V) and rated IPX7. Refers to the area above the bath or shower up to a height for 2.25 metres and requires a minimum rating of IPX4 (splash proof), plus RCD protection. IPX5 should be considered if water jets may be present i.e. for cleaning purposes. Covers an area 0.6 meters wide immediately next to, and all around Zone 1. Wash basins should also be treated as Zone 2. The minimum rating here IPX4. "Zone 2 does not exist over a sink although a number of manufacturers do state that in their manufacturers instructions (MI) that their products should not be used in this area. MI must always be followed and overrides these zones. Buying just by IP ratings isnt a failsafe as the risk of cleaning sprays has to be taken in to account as well. Given that the bathroom is a special location within the wiring regulations its always best to have the electrician agree what fittings are suitable before purchase. The electricain will have to be satisfied that they meet both the Zone requirements and manufacturers instructions for the fitting in the desired location along with checking for any changes to the supply to the room". As always seek expert advice when considering changes that involve the electrics of your home. Click here for further information on Zones and IP ratings.